A collection of 5 large maps covering Northern California. 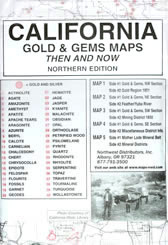 These maps show gold and silver prospecting areas, and locations where the following gems and minerals have been found: actinolite, agate, amazonite, amethyst, apatite, Apache tears, aragonite, azurite, beryl, calcite, carnelian, chalcedony, chert, chrysocolla, epidote, feldspar, fluorite, fossils, garnet, geodes, hematite, jade, jasper, kyanite, malachite, obsidian, opal, orthoclase, petrified wood, psilomelane, pyrite, quartz, rhodonite, rhyolite, serpentine, topaz, tourmaline, travertine, turquoise, and wollastonite. Side 2: Miscellaneous District Info.